For increase reputation of email server, we could adding SPF records on public DNS. as information from this link : https://support.google.com/a/answer/33786?hl=en, an SPF record is a type of Domain Name Service (DNS) record that identifies which mail servers are permitted to send email on behalf of your domain. The purpose of an SPF record is to prevent spammers from sending messages with forged From addresses at your domain. Recipients can refer to the SPF record to determine whether a message purporting to be from your domain comes from an authorized mail server. How to configure SPF records? 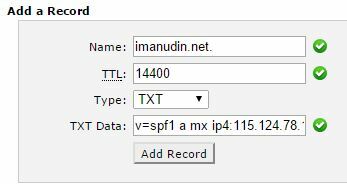 imanudin.net     IN     TXT     "v=spf1 a mx ip4:115.124.78.180 include:mail.imanudin.net -all"
Domain imanudin.net could be sent from all A records,MX records on DNS and address IP 115.124.78.180 include mail.imanudin.net as permitted sender. Besides, not permitted. saya sudah setting di cpanel hosting..dan tunggu untuk propagation ..saya check di mxtool.com hasilnya terkadang pass terkadang no published..terkadang pass spf nya.. I already resolved the problem.. I have overlooked my configuration on firewall. I forgot that I have 2 public IP’s. the one that is configured on my mail server is not the public IP that is assigned to my rDNS.. If 2 public IP from different ISP pointing to the same mail Server and acting as a failover…then what will be the SPF TEXT? 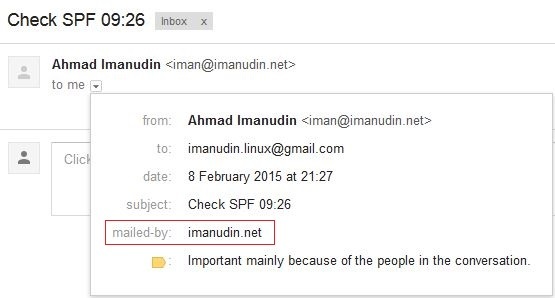 imanudin.net     IN     TXT     "v=spf1 a mx ip4:115.124.78.180 ip4:105.114.68.170 include:mail.imanudin.net -all"
thank you so much its very much useful.